Are you bored with your mundane lifestyle of work to home and home to work? Or, are you tired of having to take care of your family? Are you fed up with your study routine? Time for a tiny-winy vacation! Where to? Into the absolute wild: to Sundarbans. Not even a day away from Kolkata, Sundarban is one of the major tourist places in India and why wouldn't it be, it is home not only to the royalty, Bengal tigers but also various birds, reptiles and mammals and how can we forget the mysterious mangroves? 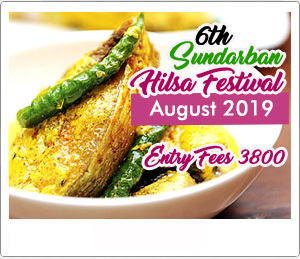 So save the dates for your West Bengal tourism Sundarban package. 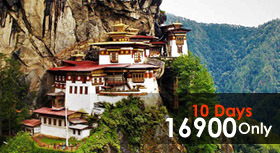 It is a 2 night 3 days package but you can also opt for the 1 night 2-day package. 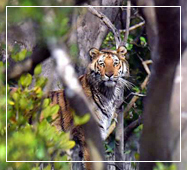 this Sundarban tour package from Kolkata will revive your body and refresh your mind. As this Sundarban tour package will take to a lifetime journey of blood-tingling woods, through the stimulating trail of Ganga surrounded by the overshade sensational mangrove while your ears are busy hearing the gripping legend of each spot and eyes busy, gazing at the exquisite and mystic forest of Sundarban. Affordability - The Sundarbans tour package from Kolkata will cover all your requirements seamlessly and will provide you with best of the Sundarban tour package rate. The Sunderban package tour price is moderate and within that, you get to experience a thorough perception of the adequate life of Sundarban. The Sundarban tour package from Kolkata is nothing fancy or luxurious but we tend to get you closer to the reality of the place, with experience of their ordinary transport, entertainment and celebration. This will further enlighten your soul and you will start to enjoy the plainness of the Sundarbans tour package. We have kept in mind, the pocket pinch of everyone and decided on the Sundarban package tour price. The Sundarban package tour rate has been kept as minimal as possible and you will definitely be able to afford the same. We promise that every penny you spend will be valued and worth it. Packing the bags - Now that the Sundarban package tour price is sorted, let's discuss what to carry along. When you opt for the West Bengal tourism Sundarban package, there are certain things that you must carry, be sure to take cameras and binoculars. Focus on choosing comfortable shoes and clothes, as per the season. And please don’t forget to throw in a hat or cap to resemble a true traveler. Hope on with us: our Sundarban tour by cruise from Kolkata starts with 2 modes of transport as discussed below. All the expenses including transport are included in the Sundarban tour package rate. So don’t wait up and come along with us on our next tour where we cover all the extremes of Sundarban travel. You are not going to be disappointed. For AC Hotel Room - Rs.1000/- Extra Per Person. Hotel Stay is Minimum Double Sharing Basis. No Gyser is available in Hotel, Per Bucket hot water charges Rs. 20/-. 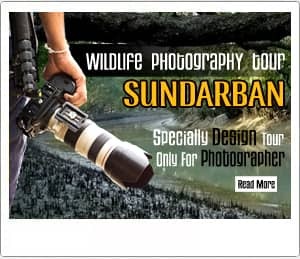 Are you interested in Wildlife Photography Tour at Sundarban National Park ? DAY 1 : Gosaba Becon Bunglow & Rabindra Nath Tagore Bunglow, Hamilton Sahib Bunglow, Birds Jungle, Pakhiralaya. DAY 2 : Pirkhali, Gajikhali, Deul Varani, Banbibi Varani, Do-Banki Tiger Reserve Forest & watch tower, Panchamukhani (Five Rever Junctions), Sudhanyakhali Tiger Reserve area & Watch tower, Pakhiralaya Island. DAY 3 : Sajnekhali Tiger Reserve forest, Mangrove Interpretation Centre, Sajnekhali Watch tower, Sarakhali. DINNER :- Fried Rice, Mutton, Salad. Lunch :- Rice, Dal, fry, Vegetable, Rui Fish, Crabs, Chatni, Papad. Evening :- Chowmin, Tea/ Coffee. Bird watching Session at 'Pakhir Jungle'. Pickup & drop sealdah by Local Train. Rs. 3500/- (Night Stay at Launch). Rs. 4000/- (1 Night Hotel + 1 Night Launch). Rs. 4500/- (Night Stay at Hotel). Rs. 4000/- (Night Stay at Launch). Rs. 4500/- (1 Night Hotel + 1 Night Launch). Rs. 5000/- (Night Stay at Hotel). 07.42 A.M - 12.00P.M :- On day one, we start our journey towards Sundarban tour from Kolkata, the Durga puja capital of India. You can avail one of the two options for traveling to Sonakhali ferry ghat, one is by train from Sealdah station and the other is by car. Starting from Sealdah Station at 7.42 A.M / 8.28 A.M By Canning local we will reach Canning Around 9.00 A.M / 9.50 A.M. Pick up from Caning Railway Station by Auto heading towards Sonakhali ferry ghat to board on launch. Now the actual thrill begins. As we board the Sundarban launch and head towards our first destination, Gosaba, the windy Matla Riverand the green vegetation upon its delta is surely to take your heart away from the dun of the city life. The Sundarban launch ride is a huge attraction in itself and does not feel like any other mundane journey. Before we even know it, we will reach Gosaba and our Sundarban tour will get a head start. Breakfast with Drinking water will be served on the launch. 12.00 PM - 1.00PM :- First, the Suburban tourism package will take us to the Sundarbans tour of 2 bungalows, the first is the Beacon bungalow. It is one of the most prominent Sundarban historical Bunglow and is famous because it was Tagore's abode during his Sundarban tour. Next, we head towards another of the major Sundarban bunglow that is Hamilton bungalow. Hamilton is called the father of Sundarban and he is said to have established the largest cooperative society in Sundarban. The Sundarbans tour package we offer covers both in details and provides you with an oral guide through the historical stories. Soon you will start to relish the nostalgia of Sundarban trip. 1.00 PM - 5.00PM :- Delicious Lunch will be served on the launch. Then our Sundarban trip moves towards the Pakhir Jungle. This place is a true paradise for bird lovers and an amusement even for the general lot. The thousands of birds from various species arrive and fly around the island, making it a beautiful destination. This makes Sundarban a great tourist place and brings you closer to the rulers of the sky. During this Journey tourist will spot seven types of kingfisher, black cormorants, egret, pond heron, Brahmani eagles, magpie robin, green bee eaters and above all getting introduced to the lovely mangroves, with surreal creatures like mud skipper fish, fiddler crabs etc. 5.00 PM - 10.00PM :- The long day of Sundarban tour from Kolkata finally comes to an end as we reach one of the residential Sundarbans hotels at Pakhiralaya Island/ Dayapur and rest to prepare for the second day of Sundarban tour package of 1 night 2 days. 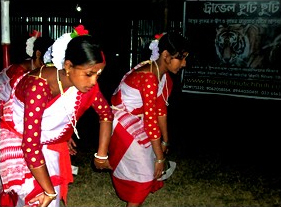 Enjoy the enchanting evening with local Folk Caltural program along with Tea and Snacks. Dinner will be served on cruise/ Hotel. 07.00 AM :- Early morning we will start Sunderban delta Safari through boat. 07.30 AM :- Start Jungle Safari guided by our Govt tourist Guide at Sajnekhali Reserve. 08.30 AM :- We will start our thrilling boat Safari through various rivers , Islands & small Creeks covering Pirkhali, SarakKhali, Gazikhali, Deul Varani, Banbib Varani. In this Tiger Reserve area for our share of viewing animals like spotted deer, crocodile, wild boar, snakes, water monitor lizard, different types of birds and also Royal Bengal Tiger ( if you are lucky). 12.30 AM :- Visit Do-Banki Tiger Reserve Area & Watch Tower. The 896 meter canopy walk at Do Banki gives you an opportunity to view wildlife from a netted enclosure. 01.30 PM :- Visit Panchamukhni through Boat. 05.00 PM :- After this thirilling sundarban national park safari we will reach at Pakhiralaya Village for marketting. 09.30 PM :- Dinner will be served at Hotel/ Boat. Bonus - if you are heading on the Sundarbans tour package somewhere around November to March, we have in store for you a special visit to Netidhopani ghat and watchtower. This place has a Hindu mythological legend. It is believed that Behula was called upon by the Hindu Gods to their heavenly abode at this very ghat. This is where she mastered the life-giving chants. The mystic and nostalgic feel of this along with a broken Shiva temple is totally consuming. 06.45 AM :- Early morning we will start Boat Safari. 08.00 AM :- Visit Sudhanyakhali Tiger Reserve & Watch Tower Breakfast will be provided in Launch. 09.30 AM :- We will start our jungle Safari through Sarakkhali 1, Sarakkhali 2 & between differnt island. 02.30 PM :- Launch will be served on launch. 07.00 PM :- We will head back to Kolkata with sweet meories. Thimpu | Paro | Punakha | Tiger's Nest Monestary | Chella Pass- The Haa Valley | Dochula View Point | Punakha Dzong | Khorbandi Gumpha | Wonkha Waterfalls | Phuentsholing | Archery Ground . .